The Tropical Ginger Plant | Tasty, Attractive and Super Healthy! 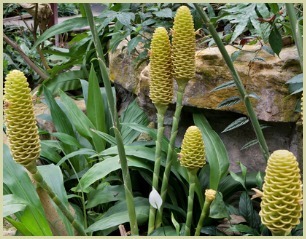 The perennial ginger plant (Zingiber officinale), which can grow to a metre tall (3 feet), is quite lovely. Blossoming into pink and white buds and pretty yellow flowers, it is often used as a decorative plant in gardens in warm climates. Most people think that the spice itself comes from the root, which is technically incorrect. It actually comes from the plant's rhizome which is the underground stem that itself sends out roots. However, while it technically is cultivated from the rhizome, it is commonly called the ginger root. When cultivating, the root is pulled up when the stalk withers, and then it is washed and scraped to prevent the root from sprouting. ...where it's an important flavouring in many Asian and Indian cuisines, as well as in Caribbean, Middle Eastern, North African and European dishes. And fresh, it's a common and critical ingredient in many South Asian, Chinese and Japanese dishes. Stir fry recipes are just not the same without it! And it's been used over the generations to ease any number of gastrointestinal problems and other ailments like sea sickness, nausea and diarrhoea to name just a few. Anyone who has settled an upset stomach by drinking ginger ale or tea knows how effective this can be. Read more about these health uses. With so many benefits of ginger, you may consider growing it at home. But be aware, as it's a tropical plant, getting a decent harvest can be challenging. The ginger plant needs warm weather, humidity, rich moist soil and shelter. And unless you live in a tropical climate, a heated greenhouse is recommended. Here's tips on growing ginger.